Trinidad and Tobago Carnival – the greatest street parade in the world – originated during the period of slavery when the slaves, banned from attending their masters’ fancy balls and parties, would improvise by staging their own costumed event in their quarters. After Emancipation, these former slaves challenged the plantation owners to publicly host their own Carnival celebration. Since then, Carnival has evolved into an inclusive, elaborate billion-dollar revenue earner for Trinidad and Tobago. Like other Roman Catholic countries involved in Carnival, these celebrations take place on the Monday and Tuesday directly before Ash Wednesday, usually marked in February or March. Activities on the two days take the form of street parades by bands of costumed masqueraders. A Carnival band could comprise as many as 3,000 masqueraders. To control this number of people on the streets, organisers would divide the band into sections of 200 to 500 masqueraders. Most Carnival bands are led by a King or Queen, some of whom had competed on Dimanche Gras (Carnival Sunday) in order to win the coveted title of King or Queen of Carnival. The epicenter for the two-day Parade of the Bands in Trinidad and Tobago is Port of Spain however, similar street parties are held at the sister capital San Fernando and at community level in Mayaro, Chaguanas, Arima and Tobago. It’s generally felt the best place to have a good time is “in town” so this is where many revelers journey in order to take part in the festivities. Another component of Carnival is the parade of traditional characters. These characters are from an earlier era and are quite ingenious. Most of these traditional Carnival characters are seen on the streets on Fantastic Friday, which is the Friday just before the Parade of the Bands. Jab Molassie: the imitation of a devil complete with painted skin, horns, a tail and three-pronged pitchfork; these characters often go around in bands, they may seem threatening but are harmless. Dragons and imps: One of the more impressive Carnival characters. The dragon comes with an awesome head with a moveable tongue and tail. The imps are usually his followers. Minstrel: Just like minstrels from long ago, these bards are dressed to the nines in black and white coattails and sing melodious tunes. Dame Lorraine: a voluptuous woman in a full-skirted dress. Her feminine features are often emphasized to the point of being outrageous. Pierrot Grenade: often dressed in a smart costume, he speaks in rhyme on topical issues. Midnight Robber: A staple at the Carnival Monday and Tuesday parade, the Midnight Robber continues the tradition of the African Griot storyteller in his own “robber talk” dialect. These solitary characters come complete with fancy costume including a broad brimmed hat and a must-have whistle. Moko Jumbie: a brightly dressed character that stands on stilts as high as 10 to 15 feet. Moko Jumbies are seen at Carnival fetes and competitions as part of the entertainment. Truly a sight to behold! Sailors: These characters embody the spirit of naval officers from an earlier period and are seen on Carnival Monday and Tuesday and Viey La Cou. Baby Doll: Though found few and far between, there’s been a resurgence of these characters in recent years. They are characterized as grown women dressed as babies, complete with bottle, bib and pigtails. Bookman: An interesting character who waltzes around with a large book and pen which he uses to write the names of prospective souls for the Devil. He usually wears flowing robes and has a large costumed head – said to be the face of the Devil himself. Indians: Featured Indian mas include depictions of Native American Indians, Wild Indians, Warahoons or Red Indians, Blue Indians which depict the indigenous tribes of Venezuala and Black Indians. Bat: Depiction of the winged mammal. This Carnival character is rare nowadays but features a costumed bat complete with wings and headpiece. Burrokeet: An ingenious piece of artistry made to look like a person riding a donkey, which forms the costumed part in this type of mas’. Burrokeet is a derivative from the Spanish word “burroquito” meaning “little donkey”. There are many cultural shows and parties ( fetes) which take place weeks before the actual street parades on Carnival Monday and Tuesday. Most are held on weekends and there are listings of these events circulating in the daily newspapers and online. Most of these fetes are guaranteed to be fun! On the competition side we have Panorama (an international steelpan competition), International Soca Monarch, Chutney Soca Monarch, Calypso Monarch, the King and Queen of Carnival, plus the Band of the Year titles up for grabs and millions of dollars in prize money. Here’s a list of Carnival dates to 2020. His song, composed in 1963, resonates up to this day as every year, for two days, the major streets of Trinidad and Tobago become the stage for colour, creativity and beauty. By beauty, we mean costumes and the people who wear them! The history of Carnival brings to bear the singular characteristic that connects us with the past – freedom. Carnival was a celebration observed by the French plantocracy, as they bade farewell to the flesh with masquerade parties before the Catholic observance of Lent. But African plantation workers also celebrated Carnival with drumology and dance. They mocked the plantation owners in dress as they paraded through their villages. They also covered themselves in oil and molasses to depict the darker side of the Carnival. A century later, with that legacy of masquerade, citizens and visitors of Trinidad and Tobago personify the freedom of self through that euphoria that emanates whether a costume is worn, music is heard or by simply watching it all. Weeks before the frenetic revelry, Trinidad and Tobago transforms to a country that survives on little sleep but thrives on incessant parties, fast-paced music, the redefinition of gravity while dancing and mouth-watering cuisine. Although Ash Wednesday indicates the beginning of Lent, a season of fasting and a lessening in indulgence, there are still some after-Carnival parties. However, the following week, all elements of Carnival would have subsided. 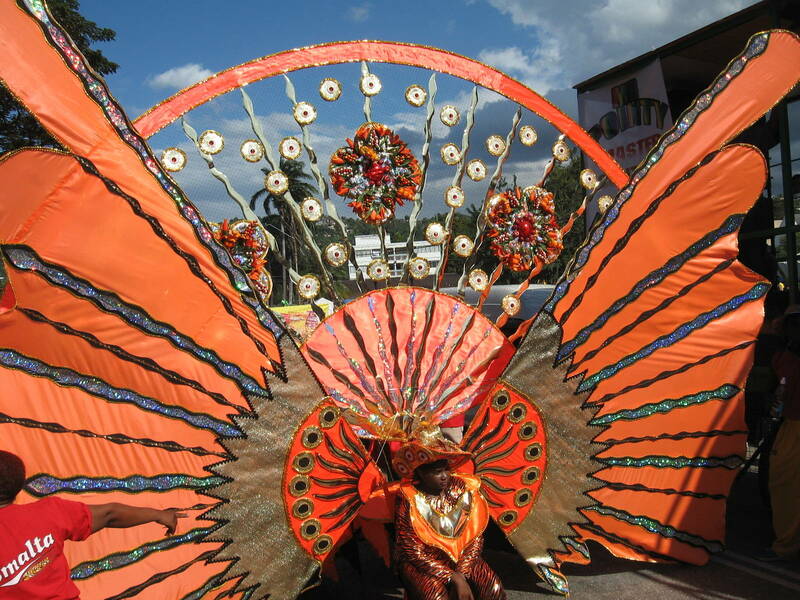 The best time to visit Trinidad and Tobago for Carnival is the week before Carnival Monday and Tuesday. By then, the finals of some of the cultural competitions would be highlighted – Soca Monarch to crown the performer with the best performance in the riveted-paced and groovy genre (Fantastic Friday), Panorama to proclaim the best band on the steelpan (Carnival Saturday), Calypso Monarch to declare the best lyricist (Dimanche Gras – Sunday). These events open the gate to the massive street parade.